We were given a jar of chilli jam by one of our neighbours at Christmas. It was delicious: so much so that it didn't last very long. 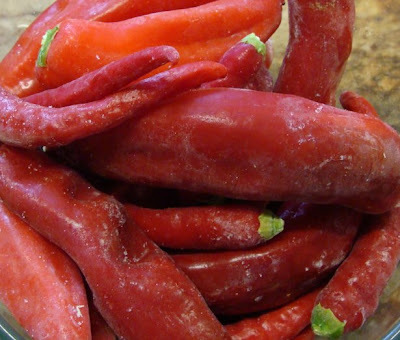 We had a bumper crop of chillies and peppers last year, a lot of which was still taking up space in the freezer. 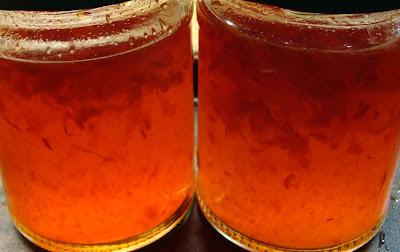 Nigella Lawson's chilli jam recipe looked like an ideal way of using some of them up while replenishing the store cupboard with fiery tastiness. I didn't have any jam sugar, so to start with I optimistically made the jelly with just regular sugar, hoping that there might be enough pectin in the chillies and peppers to set the jam. There wasn't. I bought a packet of pectin in a quick supermarket dash today and re-boiled the runny jam with it. This time it looks like it's going to set. The colour is great. I love the way that a combination of new and old food-preservation techniques means that I can be making preserves out-of-season like this with last summer's bounty.